Founded in the early 90’s by gambling giant Calvin Ayre, Bodog is up there with the most recognised names in online sports betting, but how does Bodog88 fair in terms of its casino site? 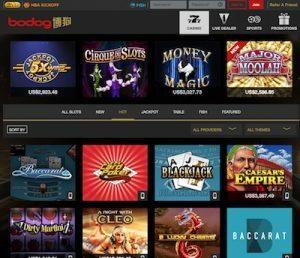 Our team of casino enthusiasts has thoroughly tested Bodog88 Casino to give our readers an idea of what this casino site has to offer when it comes to safety, software, game variety usability, deposit options, bonus offers and more. Bodog88 is an online casino site designed especially with the Asian market in mind, catering only to players aged 18+ from China, Malaysia, Japan, Vietnam, Indonesia, South Korea and Thailand. Bodog is a combined sports betting and online casino site, offering a one-stop betting shop for all your wagering requirements. Services are available in English and Chinese. While players from all other countries are restricted from opening an account at Bodog88, Bodog does allow all users to sample games for free in practice mode without having to sign-up for an account, so this may be an option if you just want to hone your skills or strategies on certain games, but will leave many real money players wanting more. You can read our helpful country guides to find out more about the best online casino sites that are available in your area. We recommend Bovada Casino as our top-rated casino for players from United States, which has some excellent welcome bonuses available for new players and hundreds of great casino games to choose from. Always read the terms and conditions, and be sure to gamble responsibly. The list of bonus offers at Bodog88 is a lot longer than what we’re used to seeing from most online casino sites, making this a good casino for those who are always on the hunt for ongoing promotions. There are different daily bonuses available to choose from, plus sign-up packages that have been customised to suit the type of game you like most. You can even get rebates for your losses on certain games, and cash bonuses for referring a friend. Unlike most other online casinos, Bodog88’s list of bonuses and special offers changes every couple of weeks, so you should head to the ‘Promotions’ page at Bodog to see what’s currently up for grabs. At the time of writing, there were eight different bonus offers available, with an additional six bonus offers exclusively for live dealer players. Note: All casino bonus offers at Bodog88 come with wagering requirements attached, so always be sure to read the fine print of any promotion to ensure you understand the play-through requirements you will need to complete before you can cash out any of your winnings made from bonus money. Undergoing some recent updates, Bodog88 now presents its entire casino platform in instant-play mode, with all games available to download free directly over your Web browser. A selection of portable casino games is also available in Bodog’s mobile casino site, which is accessible via most Internet-capable smartphones and tablets. When visiting Bodog88 players have the choice of switching between three separate platforms: Online Casino, Live Dealer and Sports Betting. The same account can be used for each gaming/betting venue, but bonuses apply only to individual platforms. Games can be sorted by such themes as Roman, Cartoon, Chinese, Aquatic, Sports, Food, Egyptian, Fantasy and TV, which gives you an idea of just how extensive the game selection is. There’s also a separate gate category called ‘Fish’ which is dedicated entirely to the premium Fish Hunter slot game from software provider AsiaGaming (AG). Asian players looking for premium live dealer casino games have come to the right place, with Bodog88 hosting a separate live dealer casino platform with games from multiple live dealer software providers including SA Gaming, Deluxe Gold and AG. These live games can’t be played for free, so you will need to sign up for an account before you can give them a go. Minimum bets start on some tables from as low as US$1.00, with maximum bets as high as $2000 depending on the game. Deposit options vary depending on the country you’re playing from but include credit card, bank transfers and Bitcoin. Bitcoin deposits are becoming more and more popular at Asian gaming sites as they offer a safe no-fee, no-fuss way to deposit without having to go through your bank account. Having made some recent improvements, Bodog88 has become quite an impressive casino site for Asian players, with a sleek design and large game selection providing a user-friendly platform to bet on a large variety of casino classics and live dealer titles. While the list of accepted countries is not long, players from China, Malaysia, Japan, Vietnam, Indonesia, South Korea and Thailand have plenty on offer to keep them entertained, and with the site licensed and regulated by Curacao eGaming you can rest assured you’re playing in a safe and legitimate space.